This overview essay was published in the Housing Finance in Africa Yearbook 2016. Across Africa, the residential investment opportunity is increasingly driving conversations about economic growth. While the definition of who is middle class and how many such households there are continue, the fact of Africa’s rising population and rapid urbanisation is palpable in its cities where the inadequate housing conditions of the majority are obvious. For every problem, there is an opportunity for a solution, and in increasingly creative ways, this is what Africa’s housing investors are finding. Take International Housing Solutions, a private equity investor that has mobilised investors including OPIC, KfW, the IFC, WDB Investment Holdings, and the South African Eskom Pension and Provident Fund into two funds, focusing on the development of affordable housing in sub-Saharan Africa. In their first fund, IHS facilitated the delivery of 28 000 affordable housing units, partnering with 19 property companies in 35 housing projects in South Africa. Based on capital invested, the weighted average internal rate of return of the exited deals is 25.2%, with an average multiple of 2.47, highlighting the viability of this market niche. Working towards the closing of their second fund (US$180 million capital raised to date, and including a green investment facility), IHS is now focusing on investments in Namibia, Botswana, and Zambia, in addition to further projects in South Africa. Also in South Africa, Chartwell has been working hard across the value chain, within the particular niche of employer housing, and particularly in the mining industry. The group provides employer assisted housing using an instalment sale financing mechanism, and also provides advisory services, and online borrower education. They have partnered with global real estate investors to achieve their vision – and through their efforts will demonstrate the potential of the residential market for international capital. Phatisa’s Pan African Housing Fund was established in 2012, and closed at the end of the third quarter of 2014 at US$41.95 million. Like IHS, the fund provides equity to developers for real estate projects on a joint-venture basis, working closely with selected developers to build technical and financial capacity to operate at scale. The PAHF is currently involved in five developments, comprising about 1 000 units and targeted at middle income earners in Zambia, Rwanda and Kenya. One of the investors in the PAHF is CDC, which committed US$20 million to the fund in December 2012. CDC is currently seeking further equity investment opportunities in the residential real estate and financial sectors, having identified housing as an important contributor to job creation and economic growth. CDC also manages DFID’s Impact Fund, which makes impact investments in Sub-Saharan Africa and South Asia, in a range of impact sectors including housing. Of all the funds that support housing delivery, Shelter Afrique is perhaps the largest. A partnership of 44 African governments, the African Development Bank and the African Reinsurance Company, Shelter Afrique signed about US$154 million worth of new loans in 2015 alone, 90 percent up in new loan signings over 2014. At the end of 2015, total disbursements reached US$103.65 million – a 42 percent increase on 2014. This growth reflects a diversification strategy that Shelter Afrique has implemented. Where previously it focused almost exclusively on developer finance of various forms, in 2015, lines of credit, mostly to local financial institutions, accounted for about 54 percent of disbursements. Another key investor is the International Finance Corporation (IFC), which this year entered into an agreement with the Chinese multinational construction and engineering company, CITIC Construction, to launch a US$300 million investment platform to provide long-term capital to develop 30 000 units over the next five years in various countries throughout Africa. Some funds are beginning to explore housing as one of many sectors in which they invest. Vital Capital Fund, for example, is a private equity impact investor, with US$350 million fund. Vital has invested US$92 million in Kora Housing, a developer in Angola that is delivering 40 000 affordable housing on various sites in cooperation with the Angolan government. Vital also has a 500-unit greenfields project in Ghana. Sofala Capital focuses on niche credit businesses that are scalable across multiple countries, and again, housing is only one of their focus areas. Their investment in Zambian Home Loans is interesting in its engagement with the owner-builder housing process that is so common across the continent. Sitting somewhere between housing microfinance approaches and mortgage finance, ZHL’s experience will offer Sofala a track record to then explore in other countries. Another impact investor, Goodwell Investments, is based in the Netherlands and has identified the lack of access to housing finance among low to middle income earners as a critical development issue facing most countries in Africa. Their Goodwell III fund (with target capital of EUR 20 million, of which EUR 10 million will be invested in financial inclusion) makes investments, providing risk capital and technical support, to commercially viable solutions that enable financial inclusion. The technical support component, offered by Goodwell Advisory Services, is an important offering, as few projects and initiatives are investor-ready. Goodwell seeks to support what look like promising projects get to the stage where they might be able to receive investments. A key challenge with foreign-denominated investments is currency risk. The African Local Currency Bond Fund (ALCB) was set up in 2012 by KfW on behalf of the German Federal Ministry for Economic Cooperation and Development, with a mission to promote the development of African capital markets. Managed by Lions Head Global Partners, the fund promotes the participation of local capital markets in developmental sectors, through anchor investments and technical assistance for bond programmes. It has a strong focus on housing. In this past year, ALCB has acted as anchor investor for various micro lenders offering housing microfinance in Botswana, Kenya, Zambia and Ghana. In 2016-17, further deals are likely to include a bond issuance from a mortgage provider in Ghana; a commercial paper programme from a mortgage warehousing vehicle in Nigeria; bond deals for a micro-lender offering incremental housing finance in Malawi, Lesotho, and Swaziland; a mortgage covered bond for a building society in Zimbabwe; and a parastatal housing developer in Kenya. In its focus on local capital markets, the ALCB is strengthening the connection between domestic economic growth and housing, and contributing to stronger financial markets in Africa that include housing as a key asset class. And then there are the various residential REITs that are beginning to emerge across Africa. Recently, we’ve been looking at residential REITs in South Africa, Nigeria, Tanzania, Kenya, Rwanda, Morocco, and Ghana. With the exception of Ghana, whose legislation began to create the opportunity in the mid 1990’s and early 2000’s, the remaining countries only developed their REIT-supportive legislative frameworks in the past few years. Still, with their internationally recognised structures and tax benefits, they have caught some investors’ attention, and notably, that of local pension funds. In very many countries, pension fund legislation requires the fund to invest a certain proportion of its capital in domestic targets. Historically, housing has not been considered a viable investment target for the more conservative pension funds; this notwithstanding their favourable term requirements which align with the longer term nature of housing investments. REITs may well be one way to enable this opportunity for local capital markets to support housing investment. Given the newness of the residential real estate market, most investors focus on the delivery of middle class, developer-built housing financed by traditional mortgages, where they can achieve a margin to support the perceived risk. However, the bulk of the demand and the opportunity is in the non-mortgage, incremental housing space. Triple Jump manages the MicroBuild Fund, set up by Habitat for Humanity International in 2012. The fund specialises in debt capital specifically for housing microfinance that is targeted at low-income borrowers. To complement the investment capital, HfHi offers technical assistance to lenders to address housing quality issues for the loans that are being funded. In addition to HfHi, Omidyar Network and OPIC are investors in the fund. Only seven percent of the funding has been invested in Africa, however, in part because the projects simply don’t exist. This has been the challenge – across the continent, investors have struggled to find investment-ready projects. And yet the need for housing is a consequence of under-investment. REALL (Real Equity for All) has been addressing this challenge head on, focusing on building development enterprises out of social movements that have prioritised housing but have lacked the capacity to deliver at scale. REALL grew out of the UK organisation, Homeless International, which in the early 2000’s supported the Community Led Infrastructure Funding Facility (CLIFF), providing capital into informal settlement upgrading initiatives around the world. REALL’s approach is that local social movements can be supported to grow into investment-worthy development enterprises. The central premise is that massive demand for affordable housing creates an investment opportunity for investors, if they structure their investments in ways that can engage with local level, small scale and community owned initiatives. REALL seeks to bridge this gap. In the five years to 2015, REALL has provided technical and financial support leading to the upgrading and delivery of housing for 170 000 people, the securing of land tenure for 1.9 million people, and improving the water and sanitation conditions for many more. REALL has disbursed GBP34 million (US$45.2 million) as capital loans for housing, water and sanitation projects targeted at very low income earners across Africa and Asia. A further GBP4.1 million (US$5.45 million) has been granted to development enterprises as capacity building support, with a view towards making them investor ready, and therefore scalable, over the long term. Over the course of the past year, CAHF reviewed the press and pulled out stories of housing developments underway across the continent. The list is not comprehensive. We found about 120 separate developments reported; it is what we could find as we trawled news sites for stories about housing in Africa. Adding all these stories together, we found promises for just over 10 million houses over the next five years. On its own, this is a significant number and promises massive investment opportunities. Just using IFC’s math, which estimates that US$300 million can turn into 30 000 houses, 10 million houses then suggests an investment commitment of over US$100 billion. The problem is, of course, that this is not near enough – assuming that it actually all gets delivered. In its forthcoming book, the African Development Bank estimates that the backlog across just nine African countries is over 26 million units and growing by at least 1,5 million units per annum. In Nigeria alone, the backlog is estimated to be 17 million units. In very many cities, the majority of housing that does exist is of poor quality (in Zambia, 60 percent of urban stock is substandard). We need much more quality housing delivery if we are to even begin to meet the challenge and seize the opportunity. Most of these investment funds were initiated when the African growth trajectory was on an upward curve. The narrative underpinning Africa’s growth story has had to change in the past year, however. 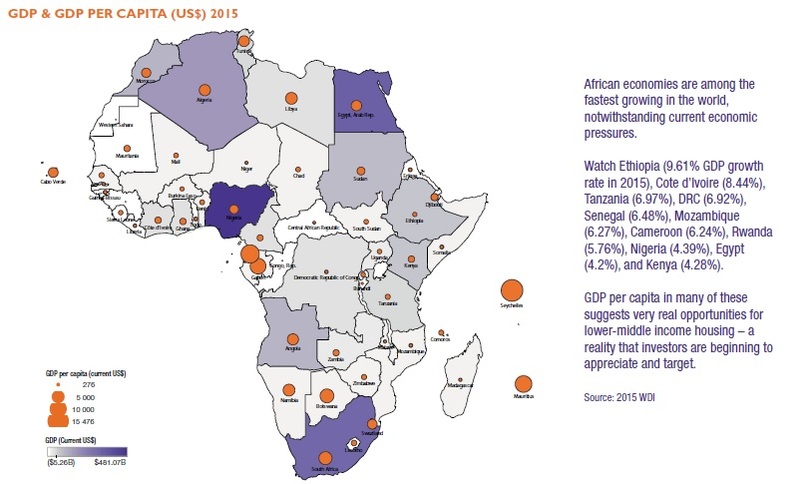 Still among the fastest growing continents, Africa has seen its growth and development prospects seriously challenged by global economic pressures, the commodities downturn and the slowing Chinese economy. Where the prospects of oil and gas discoveries dominated the news five years ago, in 2016 it is their loss in value that is making governments reconsider their economic development strategies. The key challenge in this environment, is economic diversification. Can housing contribute towards that opportunity? The role of housing in economic growth is something that CAHF has been exploring for some time. A key economic indicator in the developed world, the housing economy is not well-tracked in African countries. Property and construction data, captured as part of the national GDP statistics, conflates activity in the commercial, retail and industrial sectors with residential data; lenders do not differentiate in their monitoring and reporting between loan products; and indeed, in many contexts land rights are not captured on an electronic registry. When data is collected, it is for the high-end market – a very small minority of the overall potential for growth, and of the activity that actually comprises local housing markets. And then, of course, the majority of housing across the continent is owner-built, incrementally, without formal finance. This makes it very difficult to quantify the impact that housing has on the economy, and to then motivate for increased policy attention to address market constraints. A central component of CAHF’s mission is to improve the data available to investors and policy makers so that they can better engage in the development of Africa’s affordable housing market. There is one central indicator to test if we are on the right track: housing affordability. This is a factor of three things: house price, finance availability and terms, and household income. Annually, CAHF asks the experts contributing to this yearbook to define, from their perspective, the cost of the cheapest newly built house, built in this past year, by a private developer; and we ask for the size of that house. The data does not indicate the cheapest house that can be built, but rather the cheapest house that is being built. The distinction is important: developers choose their markets based on a variety of factors including their sense of local affordability, access to materials and finance, and their sense of local expectations. They may choose to build a more expensive house because they feel it will sell more easily, given mortgage finance that is available, for example. The data we received varies considerably, from a US$200 000 house in Angola, through to a US$8 536 house in Côte d’Ivoire. In some countries, the housing available this year is more expensive than last year: Djibouti, Namibia, Lesotho, Egypt, Mali, Togo. 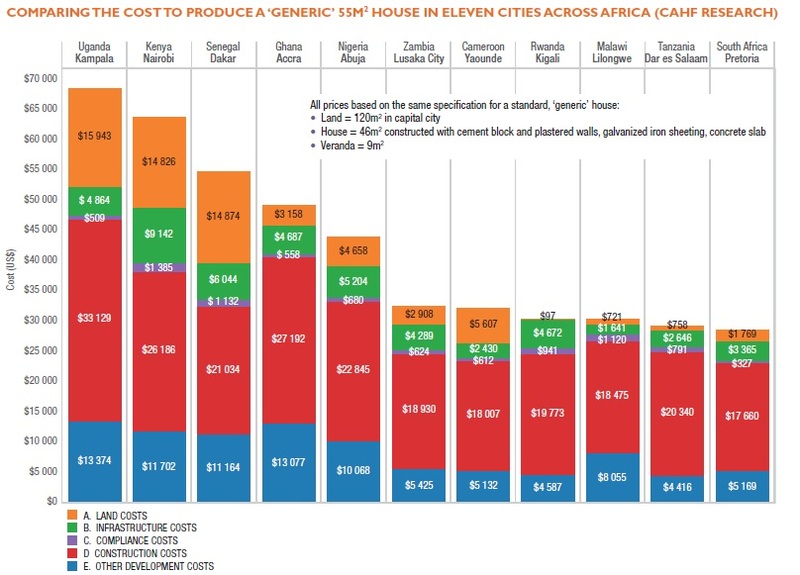 In other countries, significantly cheaper houses have been built: Botswana, Algeria, Cameroon, South Sudan, Nigeria. What the data doesn’t tell us is the scale of the delivery – is this just one housing project we are seeing, or is it representative of the delivery focus in the country? And can we compare costs when the houses themselves are different? To try and understand some of these questions, CAHF has commissioned a cross-country study into the relative cost of a ‘typical’ entry-level house (46m2 unit constructed with cement block and plastered walls, galvanised iron sheeting, concrete slab, with a 9m2 verandah, on a 120m2 plot of land), in sixteen countries. The specification was shared with quantity surveyors in each country, and costings of this house, using the same building materials and specifications, were sought. The results are still being finalised at the time of writing, but initial indications show fairly dramatic differences, with the same house costing about US$67 000 in Kampala, Uganda (the most expensive of the cities studied) and about US$30 000 in Pretoria, South Africa. Key variations were in construction costs – specifically the price of steel and labour (double the cost in Accra and Abuja than in other cities) – and land costs, where a plot in Kampala, Nairobi and Dakar was more than three times the cost of a plot in the other cities studied. Where compliance costs are minor, they also vary dramatically – compliance in Nairobi is four times as expensive as in Pretoria. This data supplements the question we’ve been asking now for seven years: what is the cost of a 50kg bag of cement? It is coming down, significantly in most countries – see the orange bar in the graph below. However, in some countries, the 2016 price is above the 2013 price – South Sudan, Burundi, Zimbabwe, Libya. High prices persist in South Sudan, Burundi, Central African Republic, Zimbabwe, Libya, Rwanda, Sudan, Burkina Faso Niger, Cote d’Ivoire, suggesting inefficient markets that are encumbered by any number of factors – transport routes, political violence, currency fluctuation, and so on. Governments can contribute significantly to a developer’s ability to deliver affordable housing at scale, by paying attention to the rough spots along the housing value chain: the availability of land, its servicing (especially water and electricity), and its registration; the availability of domestic building materials and a functioning construction sector; the time it takes to get administrative approvals for the building process, and the cost of such approvals; the taxation, finance and macro-economic framework; and the functioning of the labour market, among so many other factors. It is interesting to look at the World Bank Group’s Doing Business Indicators (DBI) in this regard. Measuring the number of days it takes, and how much it costs, to register a warehouse (this, as a proxy for residential property, which is not currently studied), the DBI between 2012 and 2016 show remarkable progress in Burundi, Morocco, Lesotho, Guinea-Bissau, Sierra Leone and Senegal in terms of time; and in the Comoros, Cote d’Ivoire, Rwanda, Guinea-Bissau, Nigeria and Senegal in terms of the cost (percent of property value). In Zambia, Namibia, and Gabon, the registration of a commercial property has become more expensive, and in Namibia and Gabon, also much slower. Of course, a key indicator of the relative health of the environment for housing delivery and investment is what mechanism of finance is available to support it. The ability of a country’s finance sector to provide affordable mortgage finance substantially impacts on both housing delivery and access by low income earners. 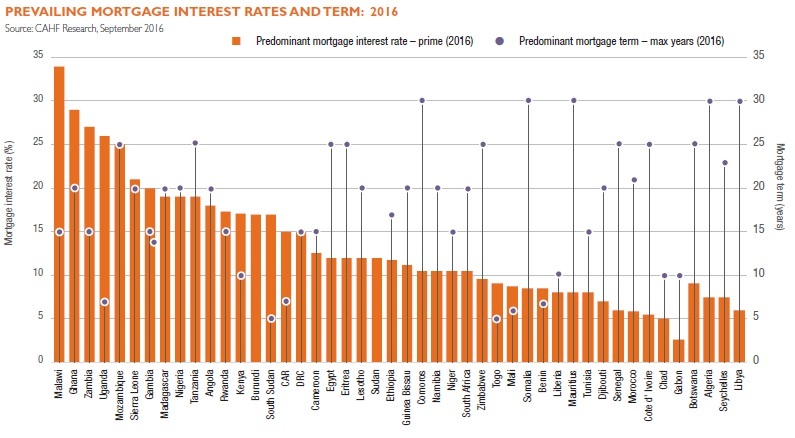 Mortgage products are available in 46 of the 51 countries surveyed in this yearbook – but their rates and terms vary widely and their practical availability is hard to tell. 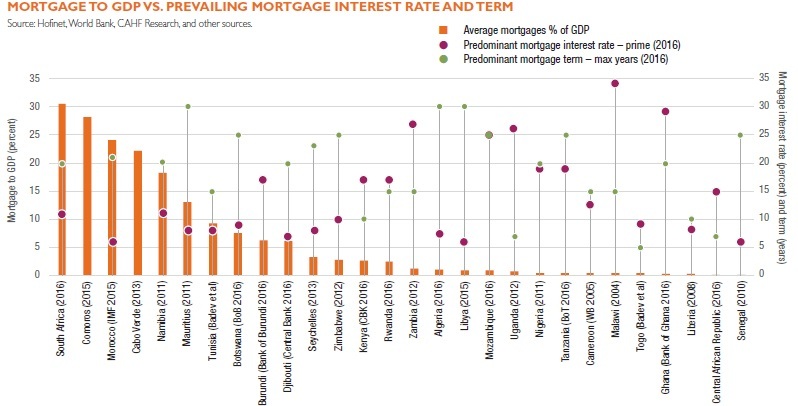 With a mortgage interest rate of 34 percent, mortgages might as well be non-existent in Malawi. Indeed, one bank in that country recently confessed its mortgage book to comprise 17 mortgages in total. Only 18 countries have mortgage interest rates of less than 10 percent and 25 countries have mortgages with terms of 20 years or longer. The consequence of this is evident in the ratio of mortgages to GDP – tiny in all countries with the exception of a few. On the flipside, this offers substantial opportunity for growth. Kenya’s mortgage market currently comprises 24 458 mortgages, with all 34 banks offering mortgage loans. With the capacity to extend mortgage finance already extant in the country’s financial sector, the scale of mortgage delivery could conceivably change, if other factors were addressed – the World Bank estimates by as much as 50 percent. Mortgage markets in Tanzania, Nigeria and the WAEMU region also stand to increase rapidly, given the support of liquidity facilities set up in those regions. And then there is non-mortgage finance – unsecured housing micro loans and savings, instalment sale agreements, even pension-backed loans – that can support lower income households improve their housing circumstances incrementally. This past year we’ve looked at some examples in Ghana, the Gambia, and in South Africa, and found that while the potential for non-mortgage lending is all the more significant, it receives much less policy and investment attention. We can offer a handful of case studies on housing microfinance and what makes business models sustainable, but no data on the scope and impact of the entire ‘sector’. This is a gap we need to address in the next year. Having considered the price of housing and the terms of finance, the remaining variable in housing affordability is household income. How much can households afford to spend on their housing given their incomes and the range of other things that occupy their finances? This is a perpetually elusive figure – not only does it vary from one country to the next, and indeed within countries, it also varies from household to household. We use proxies: a rough estimate of household income, segmented into bands that then offer the potential for different sorts of housing products, delivered all at once or incrementally, financed with a mortgage, other forms of secured finance, unsecured housing finance, or savings. Our affordability graphs use C-GIDD (Canback Global Income Distribution Database) 2015 data (in constant 2005 US$) and apply various assumptions relating to house price and mortgage affordability. Plotting the number of households by annual household income, in rural and urban areas, the graphs offer an indication of housing affordability and suggest where investors and developers might target which efforts. Affordability graphs are available for 51 countries on the African continent, available in the 2016 Housing Finance in Africa Yearbook. The bulk of the African population falls in the bands of an annual household income of US$800 – US$23 000, in 2005 constant US$. Assuming the availability of a 20-year mortgage at 15 percent interest, 25 percent installment-to-income and no down payment, this could create purchasing power for housing in the range of US$5 595 – US$63 279 and above. Currently, there is no housing available for US$5 696 – though Shelter Afrique has recently launched a competition challenging developers to build 5 000 houses for US$5 000. The cheapest house built by a private developer in 2016, according to our network, was US$8 536, in Cote d’Ivoire and in Burkina Faso. More common are houses in the range of US$15 000 – $20 000, and above. This year, 2016, marks the third United Nations Habitat Conference on Housing and Sustainable Urban Development since UN Habitat was established at the first conference in Vancouver, Canada in 1976. Meeting in Quito, Ecuador in October 2016, governments from around the world will deliberate on the New Urban Agenda (NUA), building on the Habitat Agenda agreed in Istanbul in 1996. A key challenge in the finalisation of the NUA is how governments will engage with the private sector, and specifically embrace the opportunity for private sector led housing finance. According to UN Habitat, the New Urban Agenda is “an action-oriented document which will set global standards of achievement in sustainable urban development, rethinking the way we build, manage, and live in cities through drawing together cooperation with committed partners, relevant stakeholders, and urban actors at all levels of government as well as the private sector.” It will guide governments in their policy making and focus their attention on the key issues common to them all. 44. We commit to promote the role of affordable and sustainable housing and housing finance, including social habitat production, in economic development, and the contribution of the sector in stimulating productivity in other economic sectors, recognising that housing enhances capital formation, income, employment generation and savings, and can contribute to driving sustainable and inclusive economic transformation at the national, sub-national, and local levels. 136. We will support the development of appropriate and affordable housing finance products; and encourage the participation of a diverse range of multilateral financial institutions, regional development banks and development finance institutions; cooperation agencies; private sector lenders and investors, cooperative, money lenders and microfinance banks to invest in affordable and incremental housing in all its forms. The challenge facing African governments, is how to live up to these commitments in the face of all of their other pressures. Across the continent, with the exception of the SADC Region, less than half the countries have formal, signed housing policies and even fewer have property related policies. This undermines private sector participation and limits the potential for scale. The rationale for stimulating local housing markets is clear: IFC estimates that for every house built in emerging markets, five jobs are created. The production and consumption of housing stimulates economic growth and growing property markets support enhanced financial intermediation contributing to the efficient development of national economies. And housing assets, whether geared with finance or not, can act as a financial springboard to micro and medium enterprise and human capital development. Investors are clearly interested in real estate in Africa. FDiMagazine reports that since 2011, Africa has witnessed a 187.5 percent increase in real estate FDI, citing Casablanca, Kampala and Accra as top investment destinations. The residential real estate sector, however, only held 10.34 percent share of the real estate market between 2011 and 2015. It is here that efforts to stimulate the affordable housing sector should focus. Governments have an excellent opportunity to gear this interest in support of their growth targets, while also meeting the housing needs of their growing urban populations. In the context of the economic downturn on the African continent, housing creates an important and strategic opportunity to change the narrative and drive growth from within. The opportunity is clear. The 2018 country profile for Sudan (as contained in the 2018 Housing Finance in Africa Yearbook) is also available as a separate pdf document. The 2018 country profile for South Sudan (as contained in the 2018 Housing Finance in Africa Yearbook) is also available as a separate pdf document.